The spirit of Jobim is more than a breezy Bossa Nova song. Walking in his footsteps is easy, and another good reason to fly south for the chance to get back in touch with his musical legacy. Don’t worry, you can do this and well worth the adventure. Here’s how. It’s a 30-minute walk to Ipanema from the Copacabana strip; head a few blocks in from the beach to Avenida Nossa Senhora de Copacabana (you can’t miss it) then turn left towards Arpoador. 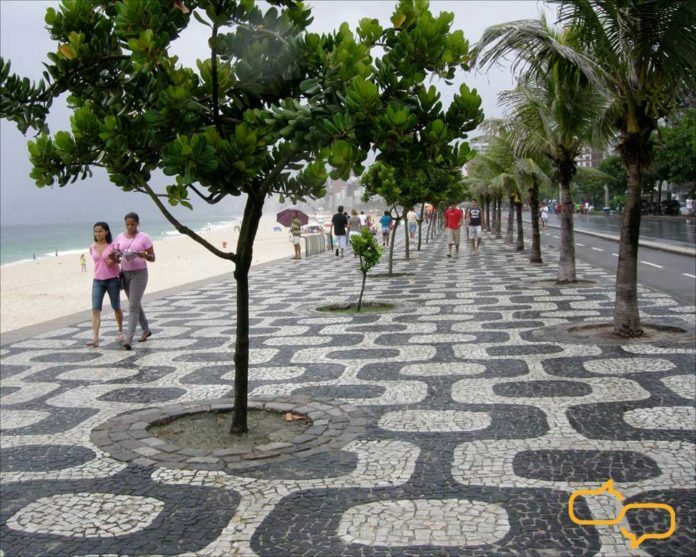 So, continue right on Francisco Otaviano, (you’ll be close to Antonio Carlos Jobim’s staute on Ipanema beach) then a short walk past Parque Garota de Ipanema to Avenida Vieira Souto, Ipanema’s beachside boulevard. You’ll pass the longtime former home of Rio’s legendary Jazzmania on the second floor of the chic and cliquey Bar Astor. Great pace for cocktails, but pass it by for now. One, two, three long blocks down to Avenida Vinicius de Moraes. Take it inland a block or so until it crosses with Rua Prudente de Morais. You’ll see the Garota de Ipanema Bar on the corner. Congratulations. You’re shadowing the spirit of Jobim, deep on the heart of the neighborhood which defined the spiritual home of his music. Inside that corner bar is a table with his name on it and a clear view of the sidewalk route that Ipanema’s most famous citizen would take to the beach: the source of inspiration for his famous song. Antonio Carlos Jobim lived in this area for awhile – not too far away before moving near his beloved Jardim Botanico and later, to the hills above Rio. “A grand panorama for his grand piano”, he might have said. In between were homes in Los Angeles and New York. He loved New York. If home is where the heart is, then surely Jobim’s spiritual home is wherever his music resides and that’s the idea of immersing yourself inthe true history of Bossa Nova. We’ve done it an you can do this: shadowing the spirit of Jobim. Rio’s muscial elegance deserves much more than a week in the Cidade Maravilhosa allows for (you’ll be back) especially at a time where – for some – the appreciation of musical creativity has succumbed to rhythmic rhyming of simple syllables. Pop music is nothing if not cyclical. But even now, nine decades after his birth, you might be hard pressed to find someone who hasn’t been touched by Jobim’s music. Antonio Carlos Jobim literally stands as one the world’s greatest pop songwriters, shaping the Bossa Nova generation, first in his own Rio de Janeiro and then for the rest of the world. It’s a timeless contribution. Even for our ‘15 seconds of fame’, selfie culture.